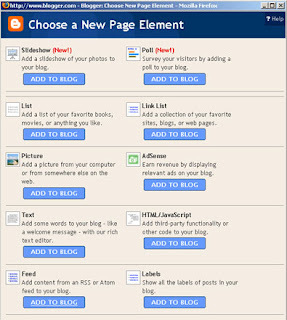 In your Dashboard click on the “Layout” link of the blog you want the last 5 post to be displayed on. In the Layout>>Page Elements page (where you should be now), click “Add a page element” link as shown below, it’ll trigger a popup window. In the popup window click “Add To Blog” under the “Feed” section found at the bottom of the pop up as shown in the picture below. 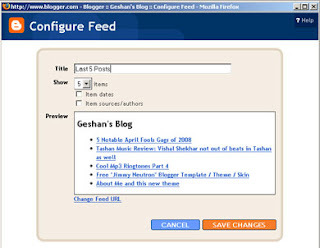 Paste your feed URL (must be like http://yourblogname.blogspot.com/feeds/posts/default) to the Configure feed page which asks for the feed URL as below and click “CONTINUE”. Alter the settings if you need to put “Last 5 Posts” in the title as shown below and click “SAVE CHANGES”. New block will appear on the section you added, to move it to above the posts drag it from the section it is in above the “Blog Posts” segment/block and it’ll place itself in a place holder there as shown in the picture below. 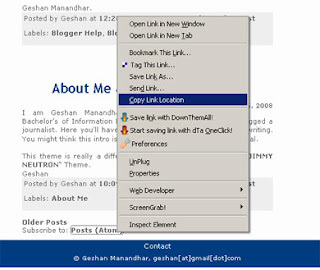 Click Save then view your blog, you’ll have the latest 5 posts. The idea is subscribing your blog with its own feed. Happy Blogging and blog templating :-).